Today Twitter has officially outed its competitor for media darling Meerkat, a live video streaming app that’s gotten a lot of coverage recently. Twitter’s version of this is called Periscope, and is now available for iOS. An Android app is reportedly in the works, but no launch timeline has been given. 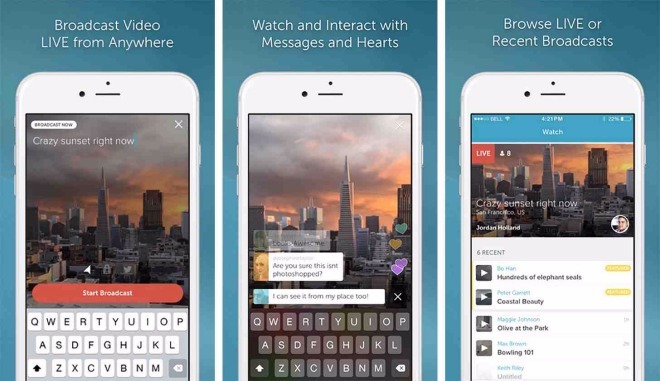 Like Meerkat, Periscope is a live video streaming app that’s easy to use. When you start broadcasting, your followers will immediately be notified, and they can comment and send you ‘hearts’ in real-time (these seem to be Periscope’s version of Facebook’s Likes). Since this is a Twitter-owned app, you can choose to share your broadcasts on that particular social network. This means you’ll automatically tweet a link to the video when it starts, letting people watch it on the Web or in the app. When your broadcast is over, a Replay option will be available to eager viewers for 24 hours (but only if you’d like it to be). If you want to only broadcast to certain people, you can do that too – just tap the lock icon before going live, and then choose who you want to share your stream with. You can follow other Periscope users and thus be notified when they start streaming.